I've always had a love of cooking. As a teenager, when most of my friends were watching sitcoms, I was watching Food Network. I was always experimenting on my family with my "creations." Recently I have found a new passion in food. I now follow the principles of Weston A. Price Foundation, using Real Food when I cook. I've eliminated processed foods from my life. I don't use too many measurements when I cook, just a lot of love. I have opened up this blog to my family and some friends, so there will be a lot of recipes to enjoy. As always, please leave comments, and suggestions. If you try one of our recipes, please let us know what you thought of it! To find out more about me, visit my personal blog here. How did this blog get it's name? Read here to find out! One of my wonderful sister-in-laws. Shes a great mom of two. She and I share a passion for food. One of her favorite weekend spots is to go hang out at the gourmet supermarket to take in the sights! You can visit her personal blog here. My Momma. Yes, I'm almost 30 and call her Momma. She encouraged my love for food by helping me cook many dinners while I was growing up. I cooked spaghetti so many times, that to this day, we are both "tired" of it. But back then she never complained. I met Jules in the blogsphere and fell in love with her blog, Far from the Sticks. Here is a little more about her in her own words: I grew up in the wilds of New Hampshire. After college I went in search of warmth and sun and ended up in San Diego. In Feb. '09 I moved to Ankara, Turkey with my fiance. Officially I am now an ex-pat. I am currently butchering Turkish in my attempt to learn it, but have had more success with the food. I pounce at any chance to try a new dish, and have few boundaries when it comes to what I won't eat. Through my exeriences I am learning the intricacies of a cuisine that varies from Mediterranean to Anatolian. Growing up I never imagined this particular adventure but nonetheless am excited for what is to come. 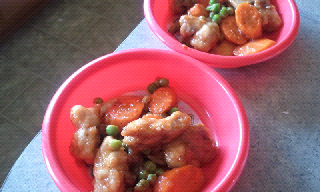 I made up this quick Sweet and Sour Chicken dish for my girls. I used a sweet and sour sauce recipe based off of Sarah, the Healthy Home Economist blog. The girls loved it! I used a small skillet and only made up enough for their lunch. I should have double the batch because they licked their bowls and asked if they could have it for lunch again tomorrow. Cut chicken into bite size pieces. Place in a bowl and sprinkle arrowroot, salt and pepper and stir until well coated. Get oil hot in a skillet and then place the chicken in it, shaking off extra arrowroot powder. When browned on one side, flip over and cook the other side. When chicken is about halfway cooked, add vegetables and continue stirring. Add sauce and bring to a boil. The arrowroot powder will help thicken the sauce and have it cling to the vegetables and chicken.